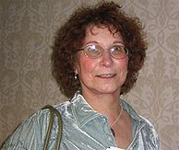 Joan D. Vinge (born Joan Carol Dennison) is an American science fiction author. She is known for such works as her Hugo Award-winning novel The Snow Queen and its sequels, her series about the telepath named Cat, and her Heaven’s Chronicles books. CLICK HERE FOR MORE BOOKS BY JOAN D. VINGE. 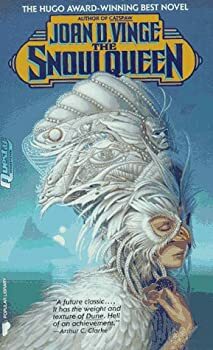 The Snow Queen — (1980-2000) Publisher: The imperious Winter colonists have ruled the planet Tiamat for 150 years, deriving wealth from the slaughter of the sea mers. But soon the galactic stargate will close, isolating Tiamat, and the 150-year reign of the Summer primitives will begin. All is not lost if Arienrhod, the ageless, corrupt Snow Queen, can destroy destiny with an act of genocide. Arienrhod is not without competition as Moon, a young Summer-tribe sibyl, and the nemesis of the Snow Queen, battles to break a conspiracy that spans space. The Snow Queen: Won the Hugo? Cat — (1982-1996) Publisher: When first published, readers young and old eagerly devoured the tale of a street-hardened survivor named Cat, a half-human, half-alien orphan telepath. Named an ALA Best Book for Young Adults, Cat’s story has been continued by Hugo-award winning and international best-selling author Joan D. Vinge with the very popular Catspaw and Dreamfall. Now, 25 years later, this special anniversary edition of Psion contains a new introduction by the author and “Psiren,” a story never before included in any trade edition of Psion. This tough, gritty tale of an outsider whose only chance for redemption is as an undercover agent for an interstellar government that by turns punishes and helps him, is as fresh and powerful today as it was in 1982. The Heaven Chronicles — (1978-1980) Publisher: This novel tells of a future where interstellar travel is a reality, but just barely. No galaxy-spanning empire, just a set of planets, some marginally habitable, full of colonists trying to survive, and sometimes to get ahead. The system was called Heaven, because it contained resources enough to sustain life and maybe even more. But when an outside starship fell into the system on a trade and contact mission, the crew discover how easily people can make a hell out of heaven. Civil war has reduced the once-great civilization of Heaven’s Belt to a set of struggling, isolated societies, each too intent on their own survival to help the others. The crew of the starship Ranger must find a way out of the system before their ship is taken and used as the last weapon for the last war. I enjoyed the differentness of this novel. Life in the future may not be as easy as most S/F tales portray it. What would our culture turn into if we ran out of resources?